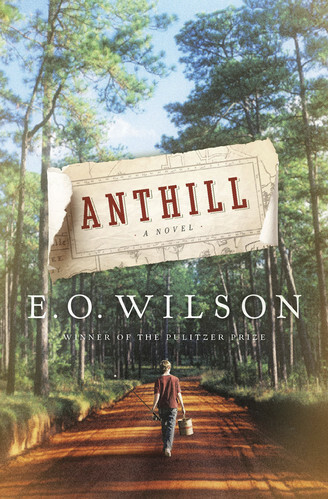 A few weeks ago, I saw an excellent review of a new book, Anthill, by E.O. Wilson. Still, after reading the review, I wasn’t sure if I wanted to get bogged down in a book about ants and an environmentalist. That’s what I thought until the other day, when I visited my local library and saw the title on the new book shelf. Clearly it was calling me, and I took a chance. I’m glad that I did. The novel traces the life of Raff Cody, an inquisitive, eco-friendly young man living “on the Gulf Coastal Plain, on the fringe of the North American subtropics,” also known as Alabama. Throughout his boyhood, Raff is completely enamored of an undeveloped piece of pristine Alabama land. His commitment to his environment follows him through high school into college, then onto Harvard Law and into corporate America. What is truly stunning in Mr. Wilson’s first work of fiction is the care the Pulitzer Prize-winning author takes in describing and celebrating the rich biodioversity that often comes into conflict with developers. While most of the book follows the efforts of Raff to preserve his piece of the planet while balancing his corporate responsibilities, one section can stand on its own as an impressive piece of writing. Part IV of the novel is entitled, “The Anthill Chronicles,” designed to be an excerpt from Raff’s thesis. The chapters contained in this section are a description of the ants nesting, living, and dying in the Nokobee wildland. Boring? Not on your life. There is intrigue and drama, wars and evolution, invaders and workers. It’s positively thrilling, and promises to open up a whole new world for readers. As an aside, I would like to draw your attention to The Scholar’s Garden blog, where Nathan Z. has captured the same passion in his two posts about starting a bee hive. Both the novel and the blog will have you sitting on the edge of your seat. As for me, I will never look at the insects in my yard the same way again. Recently, hundreds and hundreds of ants swarmed across my driveway. There I was, hovering above them, watching to see if there was a battle or a crisis. I wondered what sort of messages they were transmitting to each other. I was actually hoping that the nest and the queen were safe. Crazy? Perhaps. But E. O. Wilson, in the closing pages of Anthill, had this to say: “Nokobee was here, now and forever, living and whole and serene as he [Raff] had first found it in his childhood. . . Nokobee was a habitat of infinite knowledge and mystery, beyond the reach of the meager human brain. . . Because Nokobee survived, he survived. Because it presevered its meaning, he preserved his meaning.” And those sentiments may be why each on of us has found our place in the garden. Thanks for the recommendation, Kevin. Since my property seems to be mostly a giant anthill, this book seems like a great way for me to get a better understanding of the creatures that I share my life with. Hello, Jean. Like I said, that one section in particular is fascinating — and you will walk away with a greater awareness and a sense of wonder of all the life just buzzing, flying, crawling, and ambling just under your feet. Enjoy. Kevin, as a native of Aladambama, I read your impassioned review with a mix of fond recollections of simpler, more natural times – and the sad knowledge that much of what I knew then is gone now, wiped out by “progress.” Fortunately, memories are fine preservationists. Hi Lee. Glad I was able to stir memories. Sadly, no matter where we all got our start, we all have that same feeling toward progress and the longing what was. I hope today’s young generation will have as fond memories as we do. Well, that’s very interesting that E.O. Wilson has written fiction. He happens to be the world’s foremost expert on ants. Yes, I read that in the bio about him. He has also won the Pulitzer. This book is his first effort and fiction, and it’s a winner. Thanks for visiting!